Tag words: Streptococcus pneumoniae, S pneumoniae, pneumococcus, lobar pneumonia, pneumococcal pneumonia, otitis media, meningitis, pneumococcal vaccine. Streptococcus pneumoniae scanning electron micrograph of a pair of diplococci. CDC. A capsule composed of polysaccharide completely envelops the pneumococcal cells. During invasion the capsule is an essential determinant of virulence. The capsule interferes with phagocytosis by preventing complement C3b opsonization of the bacterial cells. 90 different capsule types of pneumococci have been identified and form the basis of antigenic serotyping of the organism. Anti-pneumococcal vaccines are based on formulations of various capsular (polysaccharide) antigens derived from the highly-prevalent strains. Streptococcus pneumoniae Fluorescent antibody stain of capsular material. CDC. The cell wall of S. pneumoniae is roughly six layers thick and is composed of peptidoglycan with teichoic acid attached to approximately every third N-acetylmuramic acid. Lipoteichoic acid is chemically identical to the teichoic acid but is attached to the cell membrane by a lipid moiety. Both the teichoic acid and the lipoteichoic acid contain phosphorylcholine; two choline residues may be covalently added to each carbohydrate repeat. This is an essential element in the biology of S. pneumoniae since the choline specifically adheres to choline-binding receptors that are located on virtually all human cells. Hair-like structures that extend from the surface have recently been described in many strains of S. pneumoniae. They have been shown to contribute to colonization of the upper respiratory tract and to increase the formation of large amounts of TNF by the immune system during invasive infection. On the basis of functional genomic analysis, it is estimated that the pneumococcus contains more than 500 surface proteins. Some are membrane-associated lipoproteins, and others are physically associated with the cell wall. The latter includes five penicillin binding proteins (PBPs), two neuraminidases, and an IgA protease. 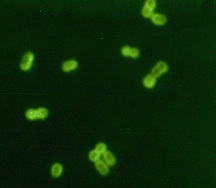 A unique group of proteins on the pneumococcal surface is the family of choline-binding proteins (CBPs). Twelve CBPs are noncovalently bound to the choline moiety of the cell wall and are used to "snap" various different functional elements onto the bacterial surface. The CBPs all share a common C-terminal choline-binding domain while the N-termini of the CBPs are distinct, indicating their functions are different. The CBP family includes such important determinants of virulence such as PspA (protective antigen), LytA, B, and C (three autolysins), and CbpA (an adhesin). S. pneumoniae has a natural transformation system as a mechanism for genetic exchange. This process is of medical significance because it clearly underlies the explosion of antibiotic resistance in the bacterium over the past 20 years. For example, penicillin resistance is due to altered penicillin-binding proteins (PBPs) that exhibit a low affinity for beta lactam antibiotics. Comparison of the nucleotide sequences encoding the PBPs in S. pneumoniae and S. mitis demonstrates that horizontal gene transfer has occurred between these two bacteria. In the laboratory, S. pneumoniae can also be transformed with genes from related and unrelated bacteria. As well, in the upper respiratory tract of the host, horizontal exchanges of genetic information could take place between strains of pneumococci that co-habitate or compete for dominance as normal flora. Streptococcus pneumoniae can also develop antibiotic resistance by the timeless process of mutation and selection. The bacterium has a relatively fast growth rate and achieves large cell densities in an infectious setting, These conditions not only favor the occurrence natural transformation but also the emergence of spontaneous mutants resistant to the antibiotic. During transformation, the binding, uptake and incorporation of exogenous DNA occur as a sequence of programmed events during a physiologically defined state known as competence. Competent bacteria self-aggregate, easily form protoplasts, are prone to autolysis and have an increased H+ and Na+ content that leads to increased glycolysis and enhanced ATP reserves. A unique set of at least 11 proteins is preferentially expressed during competence. Early in the competent state, a 17 amino acid peptide, known as competence-stimulating peptide (CSP) is released from the growing bacteria. CSP induces competence when it reaches a critical concentration that depends on the cell density, consistent with a quorum-sensing model.